Some in the industry have started to suggest that in the digital age it's just not necessary for brands to offer a clear, compelling positioning anymore. 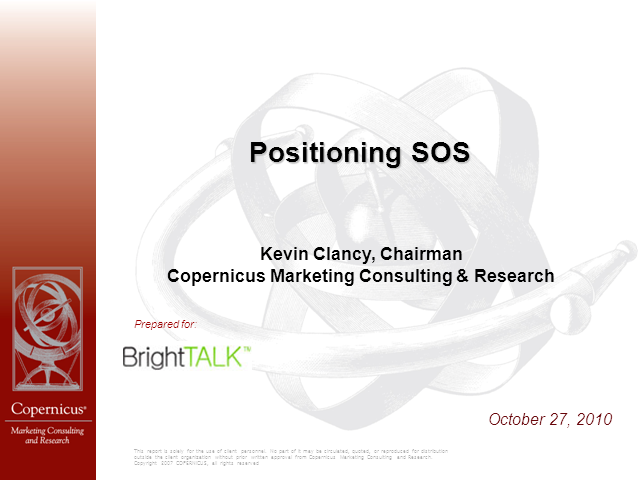 In this complimentary webcast, Kevin Clancy will offer a mix of case histories, examples, and approaches to demonstrate why having a strong positioning these days is more—not less—important than ever. • How most brands today lack a positioning. • How positioning is related to the classic definition of marketing—solving customers’ problems. • Why you should consider both tangible and intangible reasons to believe in your brand. • How to use the perceptions of your brand and those of competitors’ to help you identify areas of opportunity. This talk will provide you with a solid understanding of how to identify unique positioning opportunities that your company or brand can use to breakthrough all the competitive clutter.